Research on autism has flourished in recent years. As a result, specialism has developed and lines of research have become specialized and isolated. 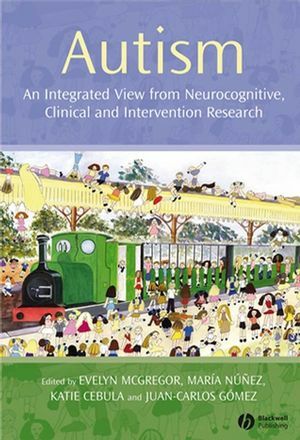 This collection of research on autism spectrum disorders investigates and cross-references a wide range of neurocognitive, clinical, and interventionist perspectives on autistic spectrum disorders research – from functional Magnetic Resonance Imaging studies to naturalistic intervention. Evelyn McGregor is a Lecturer in Developmental Psychology at the University of St Andrews. She is a founder of the Scottish Autism Research Group. Her research interests in autism include cognitive intervention, narrative ability and attitudes to inclusion. María Núñez is a Lecturer in the Department of Psychology at Glasgow Caledonian University. Her current research in relation to autism includes the cognitive basis of reasoning in interpersonal exchange. Katie Cebula currently holds a Leverhulme Early Career Fellowship in the School of Education at the University of Edinburgh. Her research is in exploring the impact of interventions for children with autism on the wider family. Juan Carlos Gómez is a Lecturer in the School of Psychology at the University of St. Andrews. His current research in relation to autism includes development of prelinguistic communication and early theories of mind in human infants, primates and children with autism. 1. Introduction: Seeking Coherence in Autism: From fMRI to Intervention: Evelyn McGregor (University of St Andrews) , María Núñez (Glasgow Caledonian University), Katie Cebula (University of Edinburgh), and Juan Carlos Gómez (University of St Andrews). 2. New Insights From Neuroimaging Into the Emotional Brain in Autism: Bruno Wicker (Institut de Neurosciences Cognitives de la Méditerranée, Marseille). 3. Directedness, Egocentrism, and Autism: Justin H. G. Williams (University of Aberdeen Medical School). 4. Altered Salience in Autism: Developmental Insights, Consequences, and Questions: Warren Jones (Yale University) and Ami Klin (Yale University). 5. Abnormalities in “Cultural Knowledge” in Autism Spectrum Disorders: A Link Between Behavior and Cognition? : Eva Loth (Cambridge University). 6. Building the Whole Beyond Its Parts: A Critical Examination of Current Theories of Integration Ability in Autism: Beatriz López (University of the West of England). 7. The Influence of Conceptual Knowledge on Perceptual Processing in Autism: Danielle Ropar (University of Nottingham), Peter Mitchell (University of Nottingham), and Elizabeth Sheppard (University of Nottingham). 8. Executive Functioning in Autism Spectrum Disorder: Where It Fits in the Causal Model: Elisabeth L. Hill (Goldsmiths, University of London). Part II Clinical and Intervention Research. 9. How Young Children With Autism Treat Objects and People: Some Insights into Autism in Infancy From Research on Home Movies: Sandra Maestro (University of Pisa) and Filippo Muratori (University of Pisa). 10. Screening for Autism Spectrum Disorders in Primary School Aged Children: Joanna G. Williams (Cambridge University). 11. The Prosody–Language Relationship in Children With High-Functioning Autism: Joanne McCann (Queen Margaret University College, Edinburgh), Sue Peppé (Queen Margaret University College, Edinburgh), Fiona Gibbon (Queen Margaret University College, Edinburgh), Anne O’Hare (Royal Hospital for Sick Children, Edinburgh), and Marion Rutherford (Royal Hospital for Sick Children, Edinburgh). 12. Teaching Adults With Autism Spectrum Conditions to Recognize Emotions: Systematic Training for Empathizing Difficulties: Ofer Golan (Bar-Ilan University, Israel and Cambridge University) and Simon Baron-Cohen (Cambridge University). 13. Developing Social Interaction and Understanding in High-Functioning Individuals With Autism Spectrum Disorder: Aline-Wendy Dunlop (University of Strathclyde), Fiona Knott (University of Reading), and Tommy MacKay (University of Strathclyde). 14. Research Base for Intervention in Autism Spectrum Disorders: Glenys Jones (University of Birmingham) and Rita Jordan (University of Birmingham). 15. Stress in Parents of Children With Autism: Richard P. Hastings (University of Wales, Bangor). 16. Conclusion: Integrating Neurocognitive, Diagnostic, and Intervention Perspectives in Autism: Susan Leekam (University of Durham) and Evelyn McGregor (University of St Andrews).